Kristy Kowal, a standout swimmer for the University of Georgia from 1997-2000, led the Lady Bulldogs to NCAA Team Championships in 1999 and 2000. She was the first woman in SEC history to win conference titles in the 100 and 200 yard breaststroke four years in a row. A three-time Academic All-American, Kowal won eight individual NCAA Championships, and in both 1999 and 2000 was named NCAA “Swimmer of the Year.” In the 2000 Olympic Games in Sydney, Kowal won the silver medal in the 200 meter breaststroke. She set one world record and eight American records, and was the first female in U.S. history to win a world championship in the 100 meter breaststroke. Kristy was named the 2000 NCAA Woman of the Year, a prestigious title based upon both academic and athletic achievement, as well as community service. Nine-year old Kristy Kowal stared at the television in awe, watching her idol Janet Evans capture three gold medals at the 1988 Seoul Olympics. Even at such an early age, Kristy knew what she wanted in life. Kristy wanted to be like her idol; she wanted to become a swimming champion. Unfortunately, there was one major problem with her plan. Kristy Kowal was not a very good swimmer. Kristy had begun swimming a few years earlier, at age 5. Like many children her age, Kristy’s early swim lessons came at the insistence of her mother, Donna, who couldn’t swim, and had a fear of water. Fortunately, Kristy had no such problem. By 1995, at age 16, Kristy had become a member of the United States Swimming team, and her dream seemed within reach. But she missed qualifying for the 1996 Olympic Team by a mere .017 seconds, forcing her to wait an additional four years for another Olympic qualifying opportunity. True to form, Kristy found additional motivation in her near miss, and used the experience to become a better swimmer. After graduating from Wilson High School in West Lawn, PA (the same school that produced NFL quarterbacks Kerry Collins and Chad Henne), Kristy enrolled at the University of Georgia. During her years at Georgia, the swimming world would learn just how much better she had become. 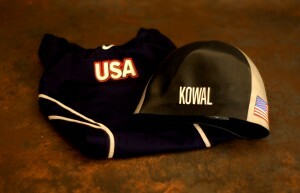 Consider Kowal’s accomplishments while swimming as a member of Georgia’s “Lady Bulldogs”. Kristy was the first woman in Southeastern Conference history to win the conference title in the 100 and 200 yard breaststroke four years in a row. She led Georgia to the NCAA team championship in 1999 and 2000. 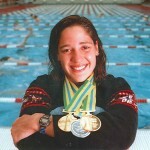 A three-time All-American, Kristy won 13 SEC Conference championships and eight individual NCAA championships, and in both 1999 and 2000, was named NCAA “Swimmer of the Year.” She set one world record, and eight American records, and was the first woman in U.S. history to win a World Championship in the 100 meter breaststroke. 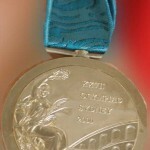 She also became the first woman in the world to break the one-minute mark in the 100 yard breaststroke. 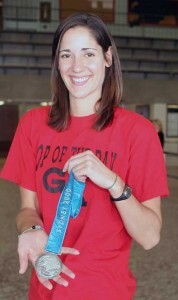 A two-time academic All-American, Kristy also received numerous scholastic awards while attending the University of Georgia. Perhaps the most prestigious of these, was her selection as 2000 NCAA Woman of the Year, an award that honors athletic and academic excellence, as well as community service and leadership. Kristy was selected for this high honor from among more than 300 nominees nationwide, representing all NCAA schools and divisions. Later that same year, she became the recipient of the NCAA’s Today’s Top VIII award, which honors eight student-athletes nationally who have distinguished themselves in athletics, academics, character, and leadership. Among those sharing the award with Kristy that year was Purdue University quarterback Drew Brees. Recently, Kristy had the occasion to show her class a photo taken in 2001 when she was selected as a Today’s Top VIII winner. “I think what impressed them most, was that I had my picture taken with Drew Brees,” she laughs. Tonight, Kristy Kowal receives yet another honor, as she is inducted into the National Polish-American Sports Hall of Fame. Her election, after only her fourth year on the NPASHF national election ballot, serves as yet another testimonial to the success she has achieved through perseverance and hard work. Asked to describe her feelings when she first saw her name on the NPASHF ballot in 2007, Kristy replies. “I was thrilled…but my dad looked at the other names on the ballot and said ‘You don’t stand a chance!” “Can I print that in the story we write about you?” I asked her in a recent phone conversation. “Sure,” she laughed, “as long as you make it clear that he was joking!” Considering the success that Ed and Donna Kowal’s daughter has achieved, it seems pretty clear that he was.